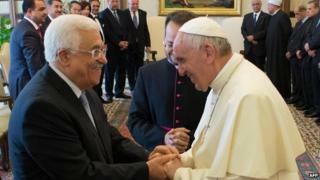 Pope Francis has met Palestinian President Mahmoud Abbas at the Vatican, calling him "an angel of peace". Israel expressed disappointment with the treaty, which uses the term "Palestinian state". The BBC's David Willey in Rome says that after 20 minutes of private talks, Pope Francis gave Mr Abbas the medallion depicting an angel of peace adding: "It is appropriate because you are an angel of peace." The Vatican's move also comes amid growing momentum to recognise Palestinian statehood.